Bring the delightful scents of summer into your garden by filling your borders with fragrant shrubs. Fill your world with fragrance this summer! Life is a garden, and what would life be without the sweet scents that surround us every day. Think of the joy felt when the first jasmine bloom exudes its fragrance in spring, or the secret pleasure of the scent of your favourite perfume on your skin, or the nostalgia evoked by the smell of apples baking in the oven. Capture the fragrances of summer by planting some scented shrubs in your garden this season. This will not only add an extra dimension to your garden, but also create a blissful environment in which to enjoy the sublime summer weather outdoors with friends and family. Plant these near benches or arbours in the garden, or near windows where their sweet scents can waft into windows and fill your home with the perfume of summer. Try the indigenous false olive (Buddleja saligna), which bears creamy flowers which give off a strong honey scent, is frost hardy fast-growing and drought resistant, or the spring-flowering sagewood (Buddleja salviifolia), which bears creamy to purple sweetly scented flowers, is also fast-growing, drought resistant and frost hardy. Both attract butterflies. The indigenous white gardenia (Gardenia thunbergia) bears masses of white, heavily fragrant flowers. It is semi-hardy and can be planted in sun to semi-shade. 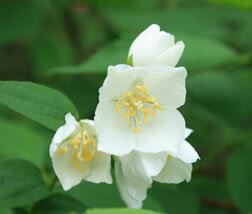 In early summer, the mock orange (Philadelphus coronarius) bears white blossoms that fill the air with a rich perfume. It is frost resistant. Yesterday-today-and-tomorrow (Brunfelsia pauciflora) looks almost leafless when in full flower in spring and summer, bearing fragrant, white, mauve and deep purple. Protect from frost in winter. Indigenous September bells (Rothmannia globosa) bears creamy, bell-shaped, scented flowers in spring and early summer. It thrives in full sun and is semi-hardy. These plants release their scent when bruised or brushed against, making them ideal for planting along a busy pathway, where passers-by will be rewarded with lingering perfumes. 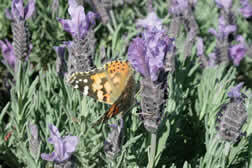 Lavender has aromatic, silver-grey or green-grey leaves and flower spikes that are green/white, pink, lavender or purple. It is a sun-lover, water wise and hardy. Rosemary 'McConnell's Blue' emits an appetising aroma. It is hardy, drought tolerant and easy to grow. Scented leaf pelargoniums have small flowers and are grown for their wide variety of leaf scents, such as lemon, orange, rose, peppermint, nutmeg that release their scent when touched. 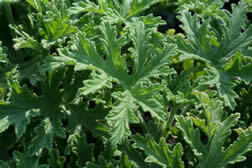 Try also pelargonium 'Mozzie Buster' which produces the smell of citronella oil, excellent for repelling mosquitoes. They thrive in sun and are semi-hardy. Sage (Salvia officinalis) has wrinkled, aromatic grey-green leaves and purple, blue or white flowers. Plant in sun or light shade. It is frost hardy. The moonflower (Brugmansia spp.) exudes its wonderful fragrance in the evenings. In addition, the huge trumpet-shaped blooms make a magnificent sight during summer. Plant this semi-hardy shrub in full sun. Note: The blooms of all moonflowers are highly poisonous.